It's England's home shirt, worn during 2009 and 2010. Look up 'understated' in the dictionary and you'll find the above picture in the definition. 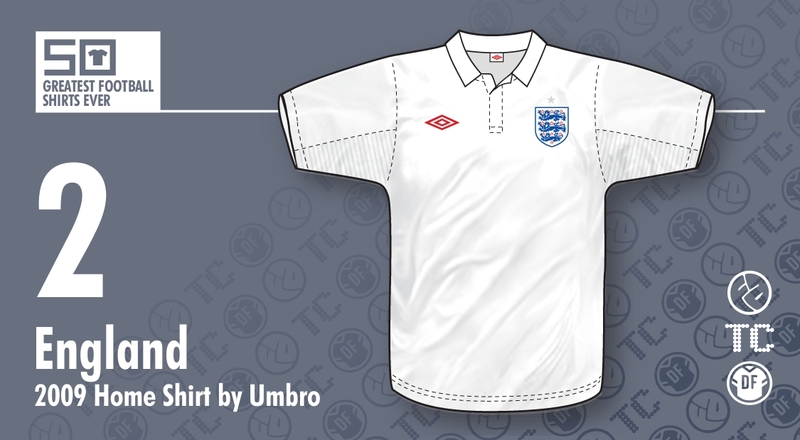 [John:] So many shirts in our countdown have had their place earned due to their game-changing and innovative design direction, but none have ripped up the rule book and raised the bar (and any other similar cliche you'd like to throw in) as this superlative Umbro England shirt. To say this was the most important kit in decades is no understatement and to anyone who dares to criticise the magnificent Umbro must have very short memories or know nothing about kit design to not appreciate the impact this shirt has had on the football world. At the time, kits seemed to be going in one direction of ever increasing complexity, brash multi-coloured panels and tired, over-thought design – typical 'average' sportswear. In fact a purported 'leak' of the new England kit just before the unveiling of the real one followed all these tired stylistic references and caused murmurings of discontent. The relief, closely accompanied by sheer wonderment when Umbro finally launched this shirt, was incredible. Plain, simple, decent collar, decent cut (which spearheaded the ground-breaking 'Tailored by Umbro' concept where all players' kits were made to measure, yes even Peter Crouch's) was a welcome breath of fresh air amongst the cul de sac that kit design was heading in. It went back to basics and totally reinvented the concept of what a football shirt could and should be. There was subtle details, and elegance throughout. You got the feeling that every stitch had meaning. Yes, the unbelievers simply called it a 'polo shirt' but they totally missed the point and failed to see the impact this strip would have, and in fact still has, as many kits even today are still following its design direction. For me, the shirt will always be at the pinnacle of what eventually proved to be a difficult time for Umbro, who under Nike's ownership eventually headed for a rapid downward turn in fortune. Perhaps their wings were burnt by this England kit? Could they ever hope to better it? Some would say that perhaps never did. [Jay:] This shirt, and the preceding template (used on number 49 in our countdown) are two sides of the same coin. The combination of a loosely cut garment, with needless knobs and whistles aplenty - and a-glaring - with its antidote, its antithesis, of a pared down, entirely function-driven, fitted and tailored piece of sartorial greatness is what me must express gratitude towards for every measured - in every sense - shirt we have today. We do have to check ourselves, that we haven't bought into the hype too much. Umbro threw a lot of marketing into making us believe that 'Tailored By' was the solution to a problem not all of us realised we had, and it wouldn't be the first time that those dastardly ad men had seduced us. Well I've checked myself: an interview with Umbro designer of the time, David Blanch, seems more genuine and to make more sense - in senses both pragmatic and idealistic - even in hindsight, than most of today's publicity guff. There was a problem, and the England '09 shirt was the solution. Part of the beauty of this release - and its accompanying range - was the recognition that not only were football shirts essentially being dipped in sprinkles at the time, but, in the case of international teams, numbers, names, competition patches and match-specific script were to be added too. It was all too much, so a minimalist shirt, on the face of it, allowed for the further embellishment (and required it on replica versions?) The reality is that the new England shirt had the accoutrements, but they were in the form of darts and cleverly curved side seams, both improving cut and effect. Excess fabric was ditched to provide a contemporary slimmer fit, the collar - despite lacking a top button - was suitably neat and tidy, even if it provoked lazy Homer Simpson comparisons, and the crest, oh my God, the crest, was beefed up and textured in brightly coloured embroidery. Just as it always should have been. For this shirt, and its influence, we will always bow down to Umbro's brilliance. [Chris:] After years of gorging itself on gaudy designs and dubious colour combinations, every team needs some metaphoric sorbet to cleanse the palate. To put it another way, every team needs to release a shirt design that's plain and basic before returning to the world of the bizarre and ridiculous. What Umbro created in 2009 was the sweetest sorbet ever. Far from basic and plain in the best way you could imagine, this was a shirt that rolled back all those years of coloured panels, needless flashes and pretentious detail. 'Smart' doesn't do it justice. The styling and sharpness of the lines this shirt possesses takes it beyond that. It was a statement of intent on the part of the manufacturers as if to say to their competitors "Is that the best you can do?" Much more than that, I cannot say because it's already been said above. It is in a distinct class of its own and by redefining 'less is more', it is easily deserving of a place in our Top 3. [Rich:] There's very little I could say that hasn't already been covered above, but my personal take on this shirt is that it was an instant classic as soon as it was revealed. It's no secret I was not a fan of the previous shirt, having described it as someone holding a bag of shapes over a shirt, then sneezing into said bag then just sticking down whatever landed on the shirt. Therefore, it's no surprise I welcomed such a minimalist shirt, but even I was taken aback at just how minimal it all was. Aside from it being an all white kit, the shirt itself was a masterpiece of understated cool. As every possible angle has already been talked about, I'll just add that the subsequent demise of Umbro was a bit of a double edged sword. Had they bowed out before this, the world may not have been so irked, but after this, the feeling the company had finally hit a rich vein of form only to be cut down in its prime not only hurt deeply, but also stoked discontent when Nike revealed their first shirt for the national team, despite it actually being a pretty solid design. Looking back, the problem with an instant icon is it makes following it an almost impossible feat...and Umbro's final two England shirts were pale shadows of this great, somewhat diluting its lasting impact. Despite this, this remains one of the best England shirts of all time and indeed, the second greatest football shirt ever!